Travel North on I-95 in New Hampshire to Exit 5, (Portsmouth traffic circle and Rt. 1 South). Bear right onto Rt. 1 South and drive 2 miles to the intersection of Elwyn Rd. /Rt. 1A South. Take a left onto Route 1A South/ Elwyn Rd. and continue for 1 1/2 miles until you reach the 3-way intersection, turn left onto Rt. 1A North (Sagamore Road). Continue on Rt 1A North, make a right onto Route 1B (Wentworth Road). Proceed past the golf course, across the New Castle Bridge, past the Wentworth by the Sea Hotel. Immediately after the hotel, take the right onto Morgan's Way (look for the tall flagpole at the entrance) and continue to the marina parking area. 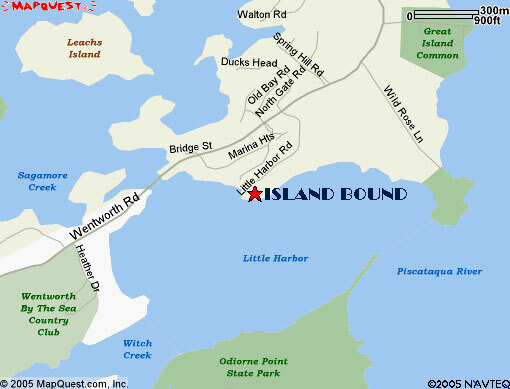 "Island Bound" is located on "A" dock, slip #1 directly at the bottom of the ramp. Travel South on I-95 in New Hampshire to Exit 5, (Portsmouth traffic circle and Rt 1 South). Take Rt 1 South and follow directions above. Travel South on Rt. 16 (Spaulding Turnpike), take the exit for the Portsmouth traffic circle and Rt 1. At the circle, continue on Rt 1 South and follow directions above. Click here for a map from Yahoo.com. Note that Morgan's Way is not listed on the Yahoo map.